Remember when we said last month that the market had slowed slightly in March? Well April made up for it! We are seeing bidding wars and lots of activity across the board, but particularly in DC and close-in markets in Virginia and Maryland. The weather may be damp, but the housing market is hot. Despite lower inventory than April last year, sales volume is up 10% from last April. 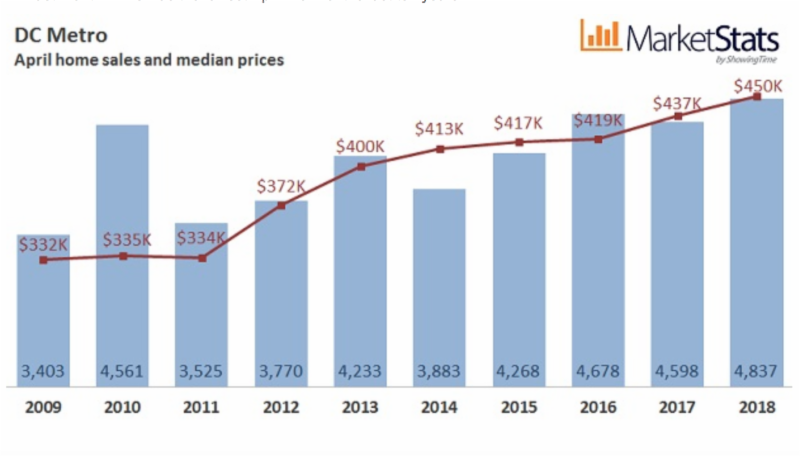 Consequently, prices are up in all locations, but particularly in DC proper, which saw a median price increase of 13.5% from April 2017 (from a median sale price of $519k in April 2017 to $590k in April 2018). We are seeing that prices in neighborhoods that were previously considered a “good deal” have also risen, meaning prices are acting more flat across the district, regardless of where a property is located. 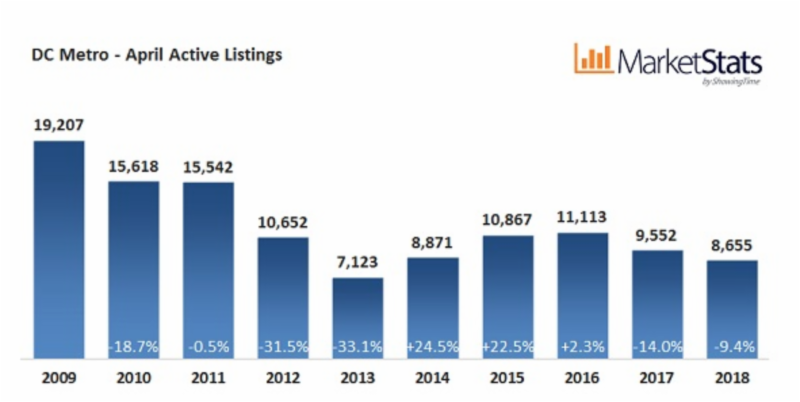 New listings were up almost 9% from April last year, but active inventory was down 9% from last April, meaning those new listings are being absorbed, plus some. This also marks 2 years of year-over-year decline in inventories, though it is worth noting that historically we are still 21% above the 5-year-low seen in 2013. Still, our own clients are still finding their home of choice and we are handing over keys all the time! Thinking of buying? Let us walk you through what this market means for your search strategy, or get started by attending our upcoming free webinar Tuesday, June 19 (registration details below). For many buyers, depending on your individual circumstance, we still think buying this year, even with all of the competition, will be better than waiting until next. With the continued emphasis on inventory, and seasonality in your favor, if you are thinking of selling, get in touch now to have us create the best strategy for you to sell for top dollar! The market is hot, but taking advantage of that competition requires the right marketing strategy and team to optimize your exposure to buyers. Check out our listing highlights below- 2 recent listings sold within days of hitting the market! 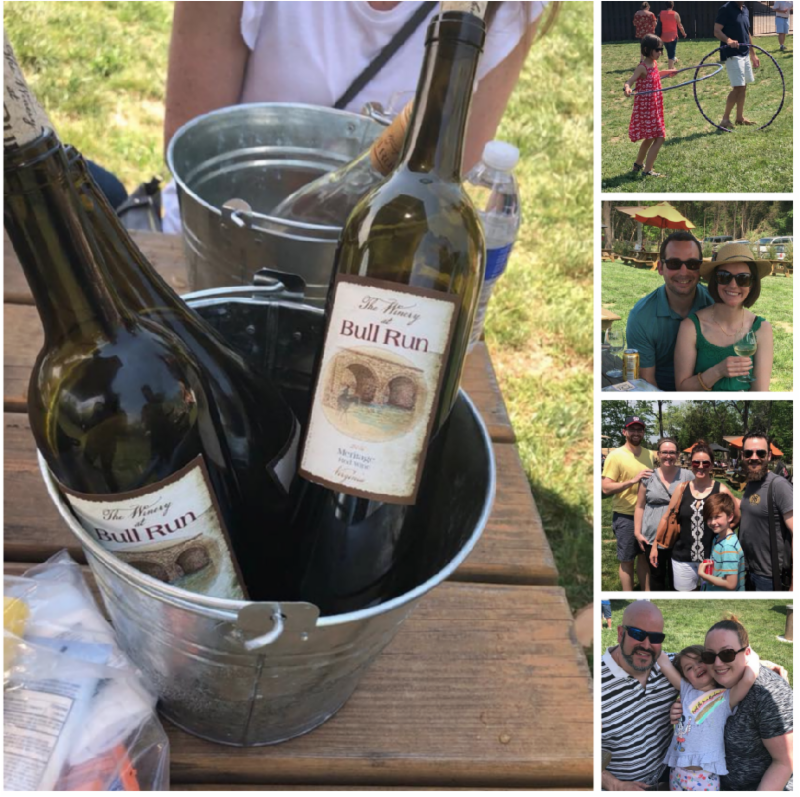 We had a great time with our clients, Saturday May 12th at our 2nd picnic at the Winery at Bull Run. The unseasonably 90+ degree weather meant the bottles of Rose went down easy in the shade! We loved seeing so many of you and look forward to catching up again at the baseball game in July! Baseball Game- Sunday, July 8th– Clients, watch your mailboxes and inboxes for your invite to our Annual Baseball game, Sunday, July 8th as the Nats take on the Marlins at home! Enjoy a quintessential DC summer afternoon and root, root, root for the home team with us! Our popular First Time Home Buyer class covers deciding to buy, financing, your home search, trends in the local market, and even the implications of the new tax law! If you want a refresher before diving into the Spring market, join us for this free class and send your friends who are thinking of buying! Register here to join. We are excited to be partnering with TAD Relocation and Grand Oaks Assisted Living to offer a seminar on downsizing and preparing your home for sale at Grand Oaks at Sibley Memorial Hospital. If you or a loved one is considering downsizing, or would just like more information about process of selling your home, join us! RSVP to mbuckl10@jhmi.edu, or call (202) 660-7882. As always, if you or someone you know has a real estate need, please reach out. We are here to help!